When Animed Vets started out in their Whitstable premises the local vet was a “James Herriot” type figure, living and working from the barely modified town house on the High Street. This was more than 60 years ago and times have changed a lot since then! Animed have always kept up with advances in medicine and surgery but their building was starting to struggle to cope. After 7 years of searching they finally found a new site in the town centre, an empty factory shell, with the Holy Grail – parking! After spending a year converting it from a dusty factory to a state of the art veterinary practice they are thrilled with the result. The practice was designed to provide a foundation for their team to be able to deliver the highest standards of veterinary care to their loyal clientele, whilst being easier to care for and clean than the previous building. When fitting out the new premises only one flooring was considered, Altro Safety Flooring. Its reputation for quality and durability was unsurpassed, however due to its slip-resistant qualities they knew that it is amongst the most demanding types of flooring to keep spotlessly clean. 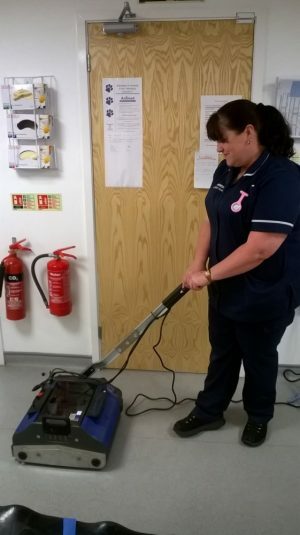 Luckily, Duplex Cleaning Machines is based just around the corner, is recommended by Altro and knew of Animed’s impending move so suggested a demonstration of their high-performance steam floor cleaner.